Back in September 2017, in what may have been the most stunning admission by Janet Yellen during her tenure as Fed chair, she said that "we don't fully understand inflation" and added that the "shortfall of inflation this year is more of a mystery." Since then, the Fed's understanding of inflation appears to have solidified at least in asmuch as the Fed remains unable to find it, despite soaring US housing prices, which continue to rise roughly 2 to 5 times faster than wage inflation every year (depending on the metro area), not to mention out of control college tuition prices, healthcare costs and sharp occasional spikes in food prices which are far more sticky to the upside, stubbornly refusing to drop after any price shock. 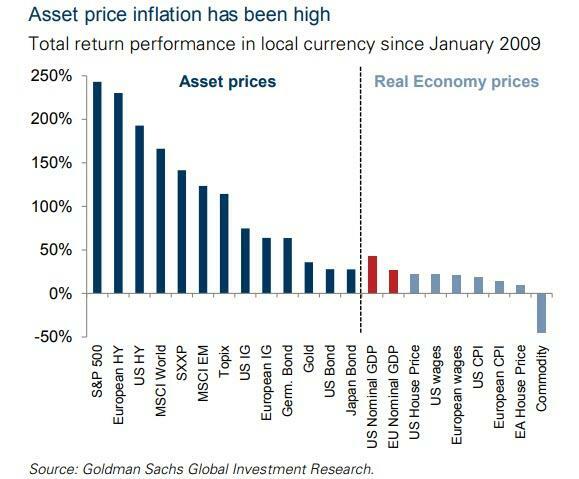 And then there are runaway asset prices and include both domestic and international stock and bond prices, which as Goldman has repeatedly shown, have soared since January 2009. Of course, the Fed ignores these and focuses only on the BLS' hedonically-adjusted, politically goalseeked CPI basket. None of these considerations mattered to Chicago Fed president Charlie Evans on Monday, however, when he again said that in keeping with the Fed's shifting approach to monetary policy which will likely include direct inflation targeting during the next recession, the Federal Reserve "should be willing to embrace inflation above 2% half the time and communicate that preference with the public to avoid missing its current target." In other words, in a country where the purchasing power and net worth of the middle class continues to erode, the Fed is willing and eager to accelerate this relative transfer of wealth from the 90% to the 1% by sending inflation into overdrive any and every time it so desires. “While policy has been successful in achieving our maximum employment mandate, it has been less successful with regard to our inflation objective,” Evans said, clearly referencing US CPI and the various "real economy prices" shown on the right side of the chart above while ignoring the asset prices on the left. “To fix this problem, I think the Fed must be willing to embrace inflation modestly above 2 percent 50 percent of the time. Indeed, I would communicate comfort with core inflation rates of 2-1/2 percent, as long as there is no obvious upward momentum and the path back toward 2 percent can be well managed." In other words, in a world in which central banks have led to unprecedented wealth divides in every jurisdiction, and have been instrumental in the at time violent polarization of the world between haves and have nots, with resulting populist consequences, the Chicago Fed president believes that the right thing to do is take what has clearly not worked so far, and to do much more of it. As Reuters notes, Evans’ remarks come ahead of a broad Fed policy review this year that may result in the central bank welcoming inflation that is "slightly and temporarily over its target." Some policymakers and analysts think the Fed now has far more ability to respond to upward spikes in prices than to persistently low readings. That is because interest rate cuts lose their potency as borrowing costs approach zero. Of course, since any alternatives to the Fed’s current approach will lead to much higher prices borne by the US middle class, resulting in an even lower standard of living, they will be definition be controversial and to Evans this means that "the central bank will need to debate those options carefully." Evans also voiced support for the Fed’s current stance of patience on any further rate hikes given “heightened uncertainty,” including the outcome of U.S.-China trade negotiations; the same negotiations which have prompted euphoric stock market bullishness virtually daily for the past 4 months every time a new flashing red headline suggest that the trade deal is "optimsitically" imminent. "At the moment, the risks from the downside scenarios loom larger than those from the upside ones," he said at a New York Association of Business Economists event. 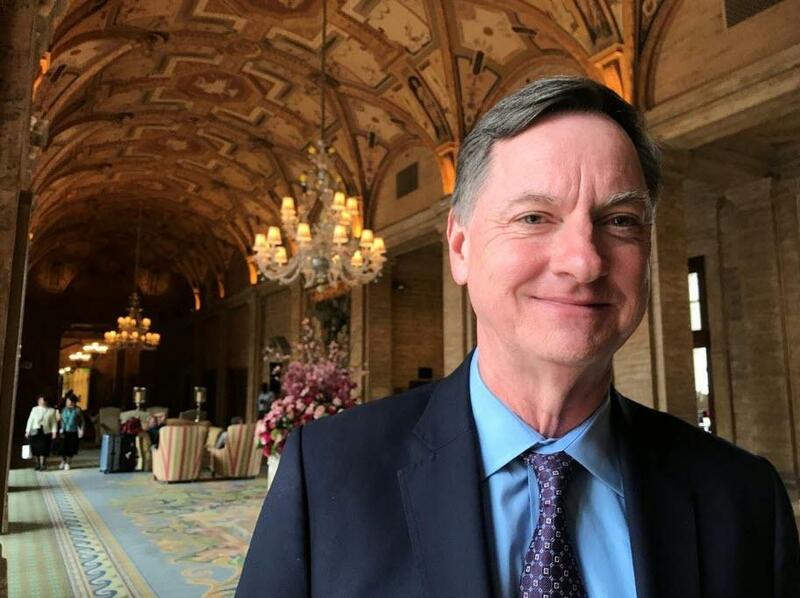 Evans, who incidentally is just another clueless economist and who gets his "signals" from the market, as recently as January forecasted three rate hikes this year, still says that “some further rate increases may be appropriate over time” if growth is close to its potential. He sees growth at around 1-3/4 to 2 percent this year, lower than his prior estimates. But wait, it gets better, because just three months after seeing three rate hikes, Evans - who was one of the Fed's greatest doves for much of the past five years - is now contemplating rate cuts and asked by reporters after his speech in New York if he would consider rate cuts to support inflation, Evans says "I think the answer has to be yes. It depends on what the scenario is." "I don’t expect that to be the case, but hypothetically speaking, that would be an argument." Another hypothetical scenario, which Evans did not mention but which is just as likely to prompt calls for rate cuts, if not QE4: a sharp drop of more than 10% in the S&P to whatever the Fed's revised "Powell put" level may be.